Khosh amadid! Welcome to Iran! Iran, once part of ancient Persia, has long been a cultural and intellectual center along the Silk Road. 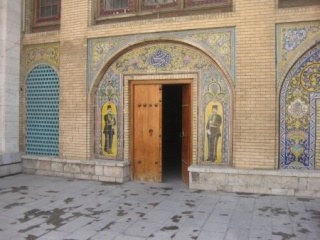 It is the birthplace of Hafez and Rumi, leaders of the great Persian literary tradition, the site of famed scientific, medical and mathematical discoveries, and the resting place of great kings. What would you expect from one of the oldest civilizations in the world? Discover the wonders of Iran! Southern Iran was originally part of Mesopotamia, considered to be the seat of civilization. The Medes unified an Iranian nation for the first time in mid-fifth century BC. Cyrus the Great further merged the Median and Persian cultures, establishing the Achaemenid Empire. Most of the region practiced Zoroastrianism which leaves its traces in contemporary Iranian customs. Alexander the Great defeated this vast Persian Empire, the largest ever seen. After Greek and Parthian rule, the Sassanid Dynasty reestablished Iran as a great empire, imbuing Silk Road trade with never-before-seen vibrancy. In the mid-600s, the Arab conquests spread Islam and the Arabic script throughout the region. By the sixteenth century, the Safavid Dynasty was in power, leading to a long line of shahs who gave the Iranian nation a newfound identity that exists to this day. Iran is a plateau rimmed by snow-capped mountain ranges and a landscape as diverse as its history. Amidst the Alborz Mountains, discover Tehran, the capital. Fall in love with the splendid artistry of the Golestan Palace Complex, decorated with murals and jewels dating back to the mid sixteenth century. Feel what it must have been like to be a visitor of the shah, marveling at the stunning mosaics, stained glass and mirrors that decorate the massive rooms of what was once a walled citadel. Spend time perusing Tehran's museums, including the archaeological exhibits of the National Museum of Iran and the impressive collection of gemstones, some of the most important in the world, found in the National Jewels Museum. Examine one of the remaining Zoroastrian fire temples, where you can learn firsthand about one of the world's oldest organized religions. Take a break and savor a cup of Iranian coffee, rest in Park-e Shahr (City Park), enjoy a delicious kebab or take a boat ride in the nearby lake. Tehran is a feast for the senses and the Bazaars are famous for their chaotic blend of vendors and stalls selling every manner of goods, from heady spices and henna, brass and silver ornaments to regional ceramics and famous Persian rugs. To get away from the hustle and bustle of the city you can head north to enjoy the clear-blue waters and sandy beaches of the Caspian Sea or hike up the hills just outside the city to the village of Darakeh. They say "Esfahan nesf-e jahan ast" (Esfahan is half the world). Famous for its majestic bridges, fine carpets and inviting hospitality, Esfahan is a necessary stop on all Iranian travel adventures. The capital of the Persian Empire in the 1600's, its architecture and monuments attest to its historic splendor and reputation as one of the most beautiful cities of the Islamic world. The Jameh Mosque with its distinctive twin minarets is one of the oldest in Iran. The Imam Mosque is a UNESCO World Heritage Site from the Safavid Period, beautifully restored to its colorful glory, and it graces the back of the 20,000-riyal banknote. On your way from the Mosque, journey through the Grand Bazaar to shop the region's famous wool carpets. Then make your way to one of Esfahan's many bridges. They are the perfect places to enjoy the breezes over the Zayendeh-rud River that traverses the city. Under the bridges explore the many teahouses and stop to sample some local gaz - nougat topped with pistachios. Cross the Siosepol Bridge to Jolfe. This district is home to a large Christian Armenian congregation and houses the centuries-old Vank Cathedral, its elegant blue and gold walls decorated in a mix of Christian and Persian styles. For unbelievable excitement, head for Shiraz, a point of high-culture, education, and beauty. One of the most important cities of the medieval Islamic world, a place of art and scholars, gardens and nightingales. Situated in the foothills of the Zagros Mountains, its altitude gives it a temperate climate with tree lined avenues and rose gardens. Cyprus trees line the Bagh-e Eram (Garden of Paradise), and the Jahan Nama Garden is similarly elegant. In the older section of town the bulb and pear-shaped domes of its mosques create a picturesque silhouette. The Arg-e Karim Khan, a massive citadel boasting a large pool and wax figurines adorned in traditional Iranian dress dominates the city center. The tombs of Hafez and Sa'di, two of the greatest poets in the Persian literary tradition are here, too. The ruins of the ancient city of Persepolis are only a short drive away. You can walk in the footsteps of Kings Darius and Xerxes amidst the remains of colossal buildings, the Hall of 100 Columns, artfully carved friezes and cuneiform inscriptions. Marvel at the wonders of ancient Persia and modern Iran and the natural beauty that surrounds them in this most ancient cradle of civilization. 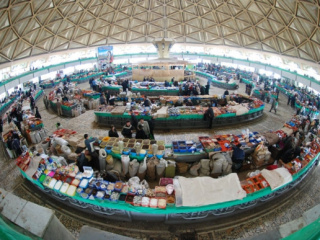 Let Silk Road Treasure Tours take you there.